Bed and breakfast in Sheffield. Sheffield is famous worldwide for its stainless steel products. Sheffield is also home to the massive shopping centre, Meadowhall. Sheffield offers plenty of entertainment, events and attractions, including Sheffield United & Wednesday football teams. The city is only 5 miles from the Peak National Park. Sheffield has an enviable choice of world-class sporting facilities including Europes largest ice complex and all season ski resort, Olympic swimming pool, golf courses & tennis and squash courts. Sheffield also hosts famous sporting events including the World Snooker Championship. Sheffield is 8 miles north of Chesterfield & 12 miles south of Barnsley. Also see Sheffield & Sheffield attractions. If you are in the right town but cannot find the accommodation you want on this page, you might consider Sheffield hotels & self catering accommodation in Sheffield. Next to Sheffield University and the city's hospitals, just 5 minutes from the city centre, this small hotel has a lively bar with free Wi-Fi and comfortable rooms. Twisted Spoon bar and cafÃ&COPY; serves a menu of home-cooked food, 6 days a week, including home-made soups, cakes and burgers. Cooked breakfasts are available, and free Wi-Fi is also accessible. All of the en suite rooms at The Harley are simple, yet well appointed, with tea/coffee making facilities. A full cooked breakfast is served in the bar area. The Harley has a busy bar downstairs, which can get noisy, and has club nights at the weekend (the hotel does provide earplugs). Late check-outs, until 13:00, are available at weekends for those who are here to party! Please note that check-in on Saturday and Sunday is from 15:00 (not 14:00). This modern hotel is just off junction 33 of the M1, 4 miles from Sheffield. It has free Wi-Fi, free parking and air-conditioned rooms with king-size beds and flat-screen TVs. The Aston Hotel Sheffield/Rotherham is 1.5 miles from Sheffield Arena and Meadow Hall shopping centre. The large rooms at Aston Hotel have power showers and large desk areas. The Magna Science Adventure Centre, Don Valley Stadium and Chatsworth House in the Peak District are a short drive away. The hotel's Bar & Brasserie 59 serve freshly prepared dishes and hot and cold beverages. With a quayside location, Hilton Sheffield has a pool and a gym, just 2 minutes' walk from the city centre. Sheffield Arena is close by. Living Well Health Club has a sauna and a whirlpool spa. There is also a beauty salon, with Elemis treatments. Each room at Hilton Sheffield has a 32-inch plasma-screen TV and 24-hour room service. Quays restaurant offers a modern British menu. Meadowhall Shopping Centre is only 10 minutes from Hilton Sheffield, by car or tram. Right in the heart of Sheffield's city centre, less than 750 metres from Sheffield Station, the hotel offers great value, with spacious, modern rooms with air conditioning and satellite TV. The Premier Inn Sheffield City Centre has a superb location, only 5 minutes' walk from the Carling Academy. The hotel has a 24-hour reception desk and all rooms have satellite TV and telephone/modem points. Some rooms can take 2 adults and up to 2 children (under 16 years). Just off junction 34 of the M1, opposite Meadowhall Shopping Centre, this modern hotel offers great value, with free parking, a restaurant, a bar, and clean, comfortable en suite rooms. The Premier Inn Sheffield Meadowhall is just a short walk from Meadowhall Railway Station and there is a tram stop even closer, with trams running regularly to the heart of Sheffield. The hotel has a 24-hour reception desk and some rooms can take 2 adults and up to 2 children (under 16 years). Right opposite Sheffield Arena and the Don Valley Stadium, this modern hotel offers great value, with free parking, a restaurant, a bar, and comfortable, modern en suite rooms. Close to junction 34 of the M1 motorway and with excellent access to the region's major road network, the Premier Inn Sheffield Arena is also opposite Ice Sheffield and the English Institute for Sport. Meadowhall Shopping Centre is only 0.5 miles (800 m) away. The hotel has a 24-hour reception desk and some rooms can take 2 adults and up to 2 children (under 16 years). This stylish and contemporary hotel offers modern, well-appointed accommodation in a great location, in the Quay Side quarter of Sheffield, close to the city centre, the train station and motorway. The convenient central location makes the hotel a great base, whether you are exploring Sheffield as a tourist or visiting the area on business. The great transport links mean the hotel is well placed for visiting any part of the city or for travelling further afield and exploring the region. Sheffield Arena and the city's theatres, including The Crucible and City Hall, are all within easy reach. All of the modern en suite rooms are stylish and contemporary with all the comforts and facilities you need in a restful, relaxing base. 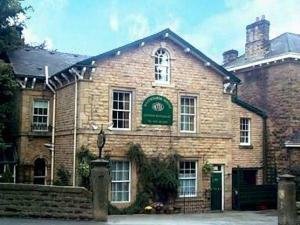 A Grade II Listed building, this 4-star hotel is in Sheffield city centre, with a private drive. There is a range of dining options and a relaxing health suite. Holiday Inn Sheffield has an elegant ballroom, boasting a wealth of royal history. Enjoy fine dining in Cunningham's Restaurant or relaxed drinks and snacks in the Grand Lounge Bar. The hotel also has a 24-hour health centre, featuring a fully equipped gym, a dance studio, a massage therapist and saunas. Local attractions include the Peak District National Park, Hallam FM Arena, Meadowhall Shopping Centre and Magna Science Adventure Centre. City centre. These luxury boutique-style apartments come with plenty of facilities and discounted, secure 24-hour parking. Each apartment has an iPod dock, Wi-Fi and free tea/coffee/refreshments. You will find that linen, towels, toiletries and robes are provided. Business services, business lunches and meeting rooms are available. Stays of 7 nights or more receive a weekly housekeeping service. In the heart of the city centre, Novotel Sheffield has an indoor pool and modern en suite rooms. Sheffield Rail Station is nearby. Each room at Novotel Sheffield Centre has an LCD TV and a sofa bed. Guests have free use of a health club close by. Elements Bar and Restaurant offers a varied menu. There is 24-hour room service. Up to 2 children (under 16 years) can stay free (with breakfast) when sharing a room with adults. Families also get late check-out on Sundays (until 17:00). Kspace Luxury Serviced Apartments offers a range of serviced apartments based on West Street in central Sheffield. Guests can benefit from free Wi-Fi. Each apartment is modern and features a fully equipped kitchen and a seating area. Guests also get tea/coffee making facilities and an en suite bathroom. This award winning property is on the doorstep of the fashionable Devonshire Quarter with plenty of shopping, restaurants and. The main High Street is a 10-minute walk away and the Supertram Network passes close by. For bed and breakfast accommodation in other areas near to Sheffield Yorkshire see Bed and breakfast in Brighouse & Bed and breakfast in Bradford.